Jim Cohen’s first goal after a debilitating stroke was to walk his daughter down the aisle at her wedding. After months of tough work, Cohen, now 62, elicited tears from every guest when he stood up from his wheelchair, took his daughter Lexi’s arm and walked her down the aisle at her wedding two summers ago. Now, Cohen, a world-class chef, who once appeared on Julia Child’s show, has a new plan. He and a buddy want to ride across the country. Jim Cohen, a world-class chef, fought back from a debilitating stroke. 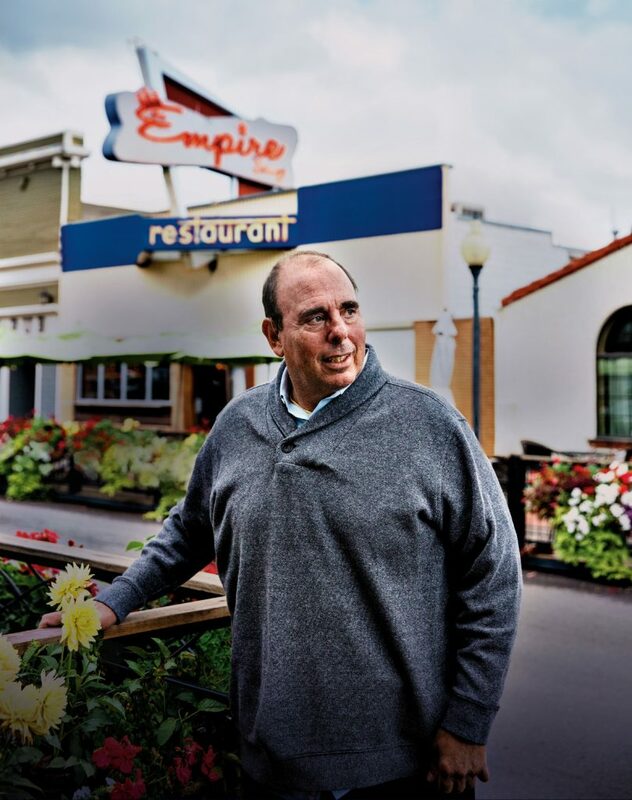 He and his family own the Empire Lounge and Restaurant in Louisville. Photo by UCHealth. You might be picturing two dudes in sunglasses on Harleys, like a remake of Easy Rider. Cohen plans to ride his tricycle. And his buddy might have to tow him part of the way or mount an engine to Cohen’s trike. The motivation for the trip is just as hilarious as the idea of two men on trikes pedaling through Iowa. Cohen’s not planning to go to some glitzy place. He wants to ride to his hometown, Buffalo, New York ­ – 1,635 miles from Denver – to prove a point. A big grin spreads across his face when he thinks about getting even with his childhood buddy, Jordan Levy, who still lives in Buffalo. 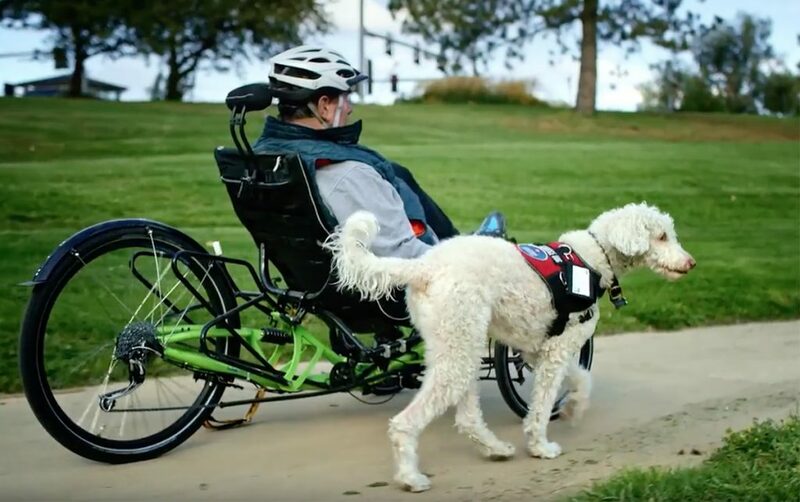 Jim Cohen riding his trike with his service dog. Now that he’s recovering from his stroke, he wants to pedal across the U.S. Photo by UCHealth. You see, back when Cohen suffered his stroke, he was “locked-in,” also known as locked-in syndrome, meaning he was totally immobile, couldn’t speak, couldn’t move, and, for a time, his tongue was stuck outside of his mouth with his teeth clamped down on it. Cohen had run fancy restaurants in Vail and around the country and trained with chefs around the world. An army of family and friends from various places raced to his hospital bedside. “We did everything when we were young together. We went to school, walked neighborhoods and ran paper routes. We were competitive,” Cohen said. Cohen wanted to leap out of bed and punch Levy. But alas, he couldn’t lift a finger. Little did friends know that Cohen found being locked in somewhat amusing. “It didn’t scare me. I found humanity funny. People want to guess what you’re thinking. I turned it into a game,” he said. Jim Cohen was ‘locked-in’ after his stroke. At first, he could only communicate with his eyes. Photo courtesy of Jim Cohen. And he drew from the strength and stamina that made him such a successful chef to fight his way back, stunning all of his doctors and rehabilitation therapists in the process. Before the stroke, Cohen had done a triathlon and had done 100-mile bicycle races before. Now that he’s mobile again, he wants to ride all the way to Buffalo to tell off Levy in person. Actually, the two men are great pals, who rib each other regularly via email. Cohen just thinks the trike trip could be a great adventure. And, like all the road trips he and his wife, Connie, a fellow chef, took when their three kids were little, they’d fuel up at all the interesting, little food shacks and diners along the way. Levy was not alone in worrying about Cohen. At first, the outlook was grim. Friends and family feared Cohen would die. If he lived, they worried he might never speak again, would have little brain function and wouldn’t be able to indulge his passion for cooking. They had no idea that Cohen’s quick wit had survived the stroke until he started emphatically rolling his eyes whenever his sister-in-law, who always had driven him a little crazy – was at his side. “Oh yeah. He’s in there,” his wife realized. Then, he started communicating by using the eye gaze chart. “There’s a lot of hope here,” said Dr. William Niehaus, a UCHealth physical medicine and rehabilitation specialist, who worked with Cohen soon after the stroke and during his stroke recovery. Niehaus was right to be optimistic. Eventually, Cohen emerged from locked-in syndrome and began moving his body, first on the left side, then many months later, on the right. Now, after nearly three years and considerable work, Cohen is thriving. Yes, he’s deaf in his right ear, blind in his left eye, talks with a gravelly voice and can’t work as a full-time chef. But, he and his family still own the Empire Lounge and Restaurant in Louisville, Cohen still whips up his favorite meals for family and friends, and once a proud “Type A” order barker, he’s now more of a teddy bear grandpa who marvels at the kindness all around him. Following the stroke, Cohen and his family moved from Boulder to Englewood. He lives close to Craig Hospital, where his UCHealth doctors sent him for rehabilitation after his initial stay at University of Colorado Hospital. Heat 1/2 the olive oil add garlic, until lightly golden. In the bowl of a food processor, combine the veal, cheese, egg, Parmigiano, nutmeg, salt and pepper. When the mixture is well-blended, shape it into several balls 1-inch diameter. Lightly dust each ball with the flour. In a large, heavy-bottomed skillet with fairly high sides, heat the oil over high heat until just smoking. Add the balls, a few at a time, and cook until they are uniformly golden brown. 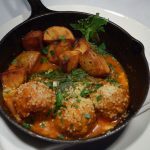 Remove with a spider or slotted spoon and keep warm while the remaining meatballs are cooked. remove celery from sauce and pass through food mill. Twice, Cohen has had little accidents when his wheelchair hit a rock or a curb and he tipped over in the road. Instead of being angry, he found himself in awe as multiple strangers helped him. “It’s amazing. So many people stopped,” he said. He also gets a kick out of simple things, like Stark. A Labradoodle, he was trained initially to help a family with an autistic child. But Stark was rejected. Military veterans seemed more interested in macho dogs, not a curly, blond Labradoodle. Cohen had to train Stark to get used to his wheelchair and the recumbent bike, but he’s become a great pal. “He picks things up. He takes clothes out of the dryer and he makes me laugh,” Cohen said. Cohen also has eased his rules on cooking. For one of his favorite recipes, he always started with whole chickens. He used to be able to break them apart and debone them in minutes. The last time he tried, it took about an hour to do one. So now, Cohen cheats like other busy cooks. He has an Instapot that he loves. He buys pre-washed lettuce. And he just discovered peeled garlic. “My favorite things to make right now are soups and stocks,” Cohen said. While he’s eased up on ingredients, he has not compromised at all on taste. After his initial stay at Craig Hospital, Cohen then spent more than three months at a rehabilitation center in Nebraska. He found the food terrible, so he started teaching all the employees and residents how to cook. Cohen loves his neighborhood grocery store, where everybody knows him and Stark. When he had the stroke, he was visiting his brother in Aspen. 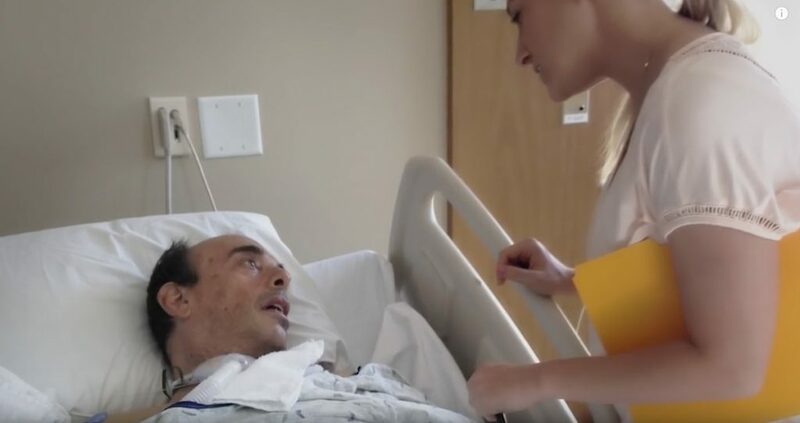 He woke up that morning, paralyzed but conscious, and knew he needed help, but couldn’t get anyone’s attention for hours. As soon as his brother discovered him, he called 911 and got Cohen help. Every second counts when it comes to strokes. Cohen thinks he actually died temporarily during his stay in the ICU. “I saw my grandmother and a woman who was their cleaning lady standing behind me,” he said. Why the cleaning lady? Who knows? That’s just another detail that makes Cohen chuckle. 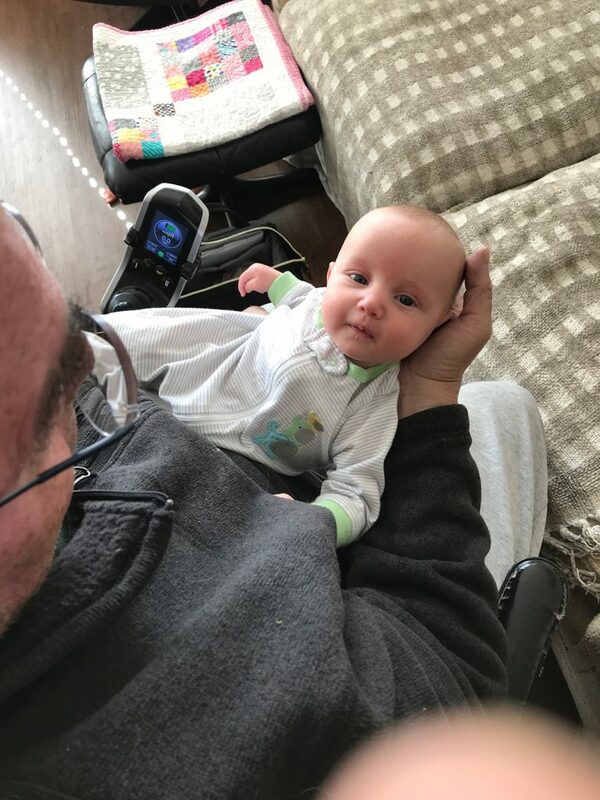 Jim Cohen loves spending time with his first grandchild, Evvy. Photo courtesy of Jim Cohen. Somehow, Cohen clawed his way back. And now, life is smiling on him. His daughter has had a baby, the family’s first grandchild. Beverly “Evvy” Scott is nearly 3 months old now. And Cohen can tell she’s going to be smart. “Her father’s a rocket scientist, so he’s training her to be a rocket scientist,” Cohen said with a wry grin. Little Evvy has reinforced Cohen’s notion that he has many reasons to live.